This post is essentially a bit of the pre-history of this blog, and there will be more of that in time. For now I want to tell about the time that the rainy weather changed my professional trajectory entirely. And, as Irving Berlin put it, oh, what a break for me! In these works, the chorale is stated with a dense and aggressively dissonant in-your-face style harmony, with interspersed flamboyant runs and arpeggios. (Hear Ton Koopman performing this work here.) 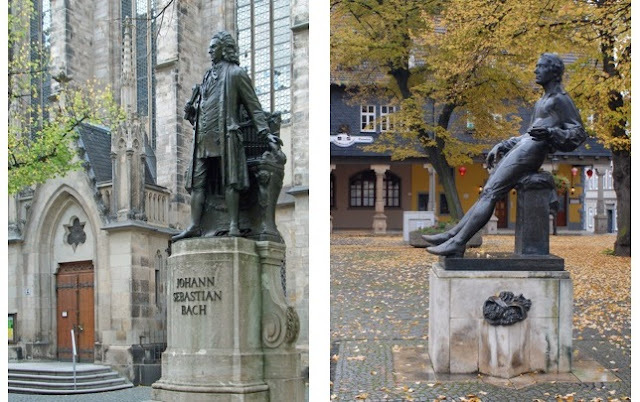 Think Jimi Hendrix playing the “Star-Spangled Banner,” but in a high Baroque vocabulary. That morning between services as I was running through the music for the evening, it occurred to me that the dense chromatic writing would make good fodder for an exam I would be giving on the following Tuesday to my Theory II students. 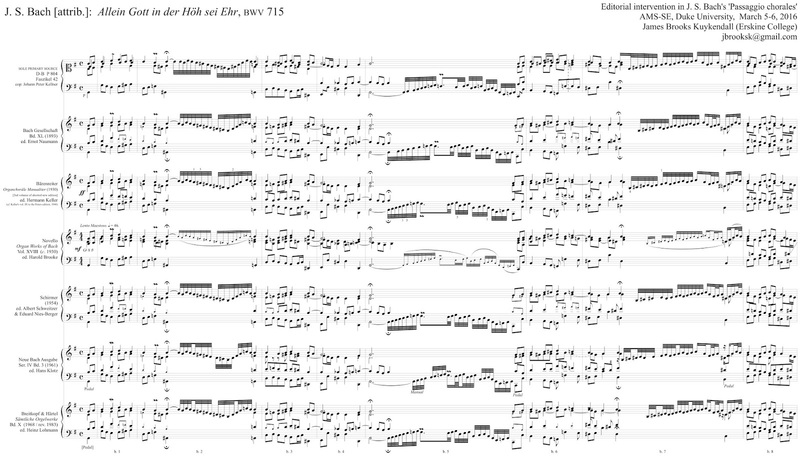 Then I had an extra credit idea: spot as many sets of parallel fifths/octaves as you can. And would my students notice the disguised B-A-C-H in the last two bars? SOURCE: conclusion of BWV 715; cropped scan of NBA Ser. IV Bd. 3 (ed. Hans Klotz, 1961), p. 15. SOURCE: the same passage; a marked-up cropped scan of the BG edition (1893), taken from the scan available on the IMSLP. Those parallels in the NBA text that do not appear in the BG text are indicated in red (although I have not marked other variants here). The parallel octave that remains is indicated in blue. SOURCES: (left) Carl Seffner's 1908 statue of Bach in Leipzig, photo from wikimedia commons; (right) Bernd Göbel's 1985 statue of Bach in Arnstadt, photo from wikimedia commons. that initial quartal harmony is, to the say the least, eccentric. There are, indeed, enough problems here to make me wonder if Kellner was working from a fully-realized score at all, particularly as the four extant chorales apart from the two Kellner copied exist in two separate lines of transmission—one with full realized harmonies, and the other employing figured bass. 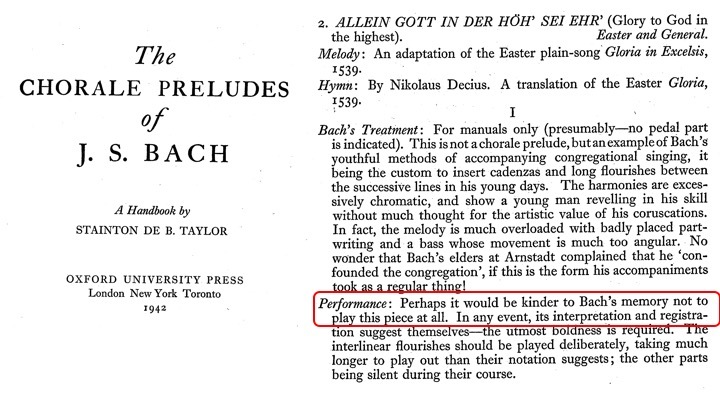 If Kellner was trying to realize the figured bass, though, he did it exceedingly poorly in this case. 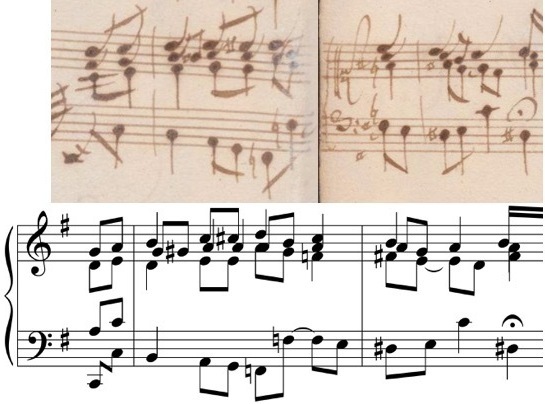 While such a thick texture means that parallels are inevitably present, the parallel fifth in the final cadence which had been eliminated in BG is here eliminated by means of precisely the same strategy—arriving at the tenor C early, echoing the cadence which had concluded the fourth chorale phrase. Curiously, BWV 715 is the only one of the 154 pieces in this collection to be attributed to J. S. Bach. There are several other passaggio chorale settings—not surprising, as it was a common practice for chorale playing during the eighteenth century. If Kittel was the conduit through which BWV 715 entered this collection, it suggests that JSB didn’t regard this showy style of harmonizing and peacock preening as a youthful indiscretion set to annoy his Arnstadt elders: he was still conveying it to his students in Leipzig in his very last years. I have much more to say about these pieces, and eventually I need to get around to writing that article, if it doesn’t get scooped. In the meantime, I reflect upon the strange intersection between weather and career: if it hadn’t been raining on that Monday morning, all of the subject matter of the blog would have remained for me just items of idle curiosity, and you wouldn't be reading this now. Long as I can be with you, it’s a lovely day.